There is something about being outside in the fresh mountain air that makes your mind and body continually look forward to that next meal. Crystal Mountain has many on-mountain restaurants for lunch. Click here for an overview. Handmade gourmet food, gracious service, cocktails and a wide variety of Northwest wines and microbrews are served daily in an atmosphere of casual sophistication. Kids’ menu available. Click here. 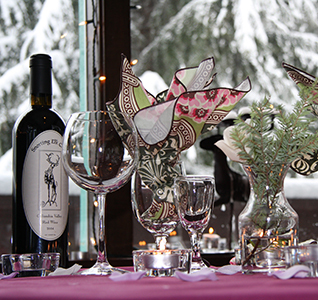 Stop by the Snorting Elk Deli apres ski for a casual dinner. Homemade soups, delicious pizzas and calzones, signature sandwiches and incredible baked goods are the choice of locals in the know. Kids welcome. Click here. World famous and recognized by Skiing Magazine as one of North America’s top ski bars and home of the best “shot ski”. A huge selection of Northwest microbrews on tap, plus a full bar. Take off your boots, pull a chair up to the giant fireplace and relax. Live music on weekends, Taco Tuesdays, Sushi Wednesdays and special midweek events like the Polyesta Fiesta. Click here. This casual full-service restaurant is a great place for apres ski and dinner. Huge burgers, delicious sandwiches, gourmet appetizers and daily dinner specials are accompanied by specialty drinks, hot chocolate, coffee and more. Kids welcome. Click here. A historic local tavern featured in Northwest Best Places, in the nearby town of Greenwater. Families now welcome! The “Cheez” has been a favorite local hangout for years, with lots of local memorabilia, a fireplace perfect for roasting hot dogs, incredible nachos and handmade milk shakes. Of course, they have beer, wine and full bar service too. Crystal Mountain has many on-mountain restaurants for lunch. Learn more. For a unique experience when you’re skiing and boarding. This sit-down restaurant has gourmet food and outstanding views of Mt. Rainier. The great part is they’ll get you in and out quickly if you like, or linger with a glass of wine or a great microbrew. Learn more. Open for a sit-down lunch Saturdays, Sundays & holidays. Families welcome. Delicous soups, salads, sandwiches and more. Learn more. Another locals’ favorite for lunch. Great soups, salads, burgers…and their cookies are to die for! Click here. Another favorite of skiers and boarders. Located at the top of the Forest Queen lift. This new 12,500 restaurant is the crown jewel of Crystal Mountain's dining. For 2017/18, there's even a new bar and wood-fired pizza! Other food “stations” serve stir fry, pizza, soups, pasta and more. Learn more. Cascade Grill, the Bullwheel, Chinook Café or Fireside Cafe. Located at Crystal Mountain base area. Learn more. (see above) is a great choice. A wonderful relaxing way to start your day. Learn more. A great spot to grab a quick bite. We love their breakfast sandwiches! Learn more. Muffins and breakfast sandwiches on your way to the hill, plus you can pick up that extra hat or extra layer you need. Learn more. Breakfast sandwiches and biscuits with gravy while you shop for snowboard gear (or a snowboard rental). Learn more.